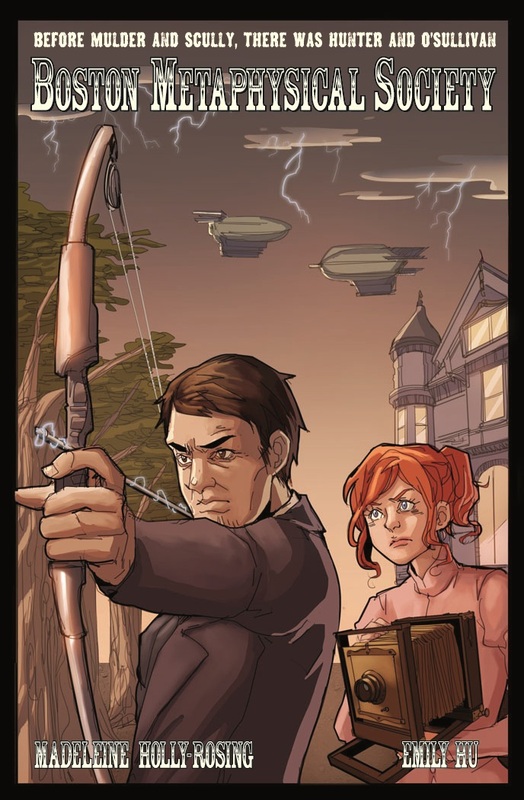 The Fellowship is pleased to recommend the webcomic BOSTON METAPHYSICAL SOCIETY. It is created and written by Madeleine Holly-Rosing, with art by Emily Hu. Boston Metaphysical Society is a team lead by detective Samuel Hunter, medium Andrew O’Sullivan, and scientist Granville Woods. When their most recent case ends with the death of O’Sullivan, his daughter shows up to take his place as medium and spirit photographer. Reluctantly, he gives her a trial period to which she shows she can handle the job. Hunter is approached by a secret organization called B.E.T.H. who wishes to join forces to find a particular spirit called “The Shifter.” He leaves as the debate on the wisdom of such as union should happen. The Society jump onto their next case claims of a demon killing five men. But are their deaths at the hand of the supernatural, or something more…human? Holly-Rosing’s writing is top notch. Nice little touch of the members of B.E.T.H. being Alexander Graham-Bell, Thomas Edison, Nikola Tesla, and Harry Houdini. Emily Hu’s art is impressive, very detailed and beautiful. Both creators have bright futures in the comic industry – web, digital, or print. Gloria Caeli and Fahriza Kamaputra’s color set a great mood for the dark period piece. The BOSTON METAPHYSICAL SOCIETY webcomic posts every Thursday, and can be found at bostonmetaphysicalsociety.com. The first chapter is available to buy at bostonmetaphysicalsociety.com/id29.html.